New children's book teaches bias, anti-Israel sentiments, and leaves out any mention of Israel itself. A professor known for writing anti-Israel posts launched a new children's alphabet book titled "P is for Palestine" which makes no mention of Israel. The book goes through the entire alphabet, associating each letter with "Palestinian" culture. A, for example, is for "Arabic," while "I" is for "Intifada, Arabic for rising up for what is right, if you are a kid or grownup!" Author Golbarg Bashi works as a Pace history professor and is a former Rutgers instructor on Iranian studies. She raised $15,000 through a crowdfunding campaign in order to publish her book. Previously, she wrote several anti-Israel blog posts, one of which claims that "By all measured historical accounts . . . Israel is a racial and religious apartheid state." Speaking at the Book Culture on Columbus bookstore reading on Saturday, Bashi said she "came up with the idea for this book after I couldn’t find a book about Palestine for children." "I love ABC books personally, and I have so many of them at home about all kinds of places — Mexico, United States, Italy, everywhere." The New York Post brought the reactions of various mothers exposed to the book. "Omg. Crazy. I’m livid at this, I can’t believe it’s real and in NYC!" one woman wrote on Facebook. "A children’s book on Palestine that doesn’t recognize the state of Israel . . . is very sad," a second woman noted. Another post says, "You have gall advertising your incredibly politically insensitive book on this site. You must have known you would be igniting a political firestorm by posting that in the hopes of drumming up sales for your ridiculous book . . .It’s disgraceful." In reality, there was never an independent Palestinian Arab state. Prior to the creation of the modern-day State of Israel, Palestine was the geographic name given to the area by the Romans after they destroyed Judea, became part of the British empire after WWI, and prior to that, was part of the Ottoman empire. The only time "Palestine" was independent was when it was ruled by Jews during the First and Second Temple periods. During the First Temple Period, it was called "Israel" in the north and "Judea" in the rest of the country.. 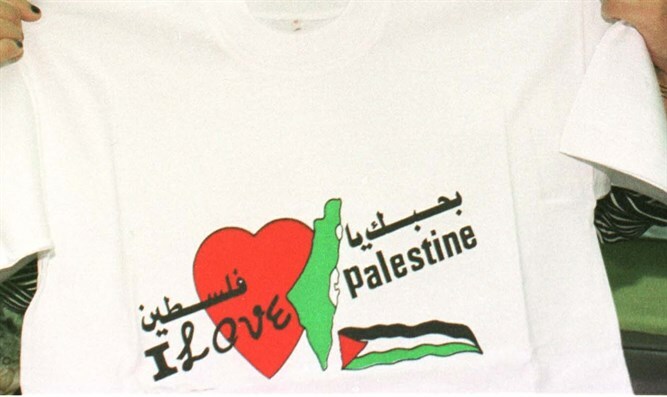 The concept of an Arab "Palestine" was born after the Six Day War, when Jordan lost the Judea and Samaria region to Israel after attacking the Jewish State. It then relinquished control of Judea and Samaria, and the Jordanian citizens living in those areas refused to accept Israeli authority. In the words of one man, "One day we were Jordanian citizens, and they promised us the war would be over and we would win. The next day, the war was over and we had lost. They took the star out of our flag and told us we're not Jordanians anymore, we're Palestinians." Earlier this year, a book entitled "A History of the Palestinian People: From Ancient Times to the Modern Era" proved to contain nothing but blank pages, since, in the words of Deputy Foreign Minister Tzipi Hotovely (Likud), "The Palestinians don't have kings and they don't have heritage sites...[they] are appropriating Jewish heritage sites and displacing them. "